Heading southeast from Bandung, the road passes through rolling hills and scenic volcanic peaks – this is the Bandung Yogyakarta road as far as Banjar. 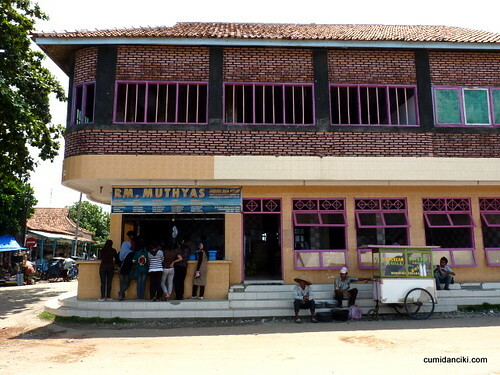 If you go via road taking the bus for example, it will only drop you so far as Ciamis or Banjar. That is why taking the 4848 is actually the best bet as it brings you straight to Pangandaran Beach. The 4848 left Bandung at 5.00pm finally arrived at Pangandaran at 11.00pm at night (2 hours over the stated travel duration with the multiple stops for passengers and dinner) and we arrived in darkness once again. We were fortunate to have the whole rear seating in the van 90% of the way until a family of 8 hopped on. A Rp2500 admission charge is levied at the entrance of Pangandaran ( the Lonely Planet states Rp3500, but it has since been reduced). 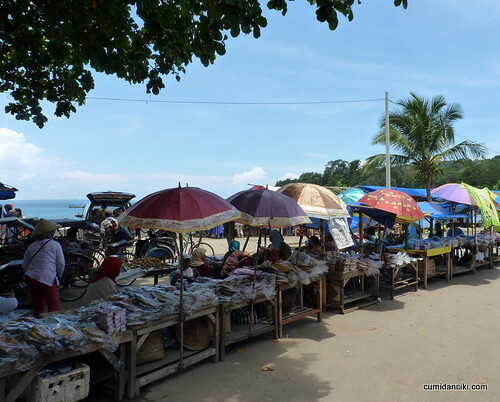 The good thing about the town of Pangandaran is that there a many hotels along the beach front and you can take your pick by just walking along the strip. 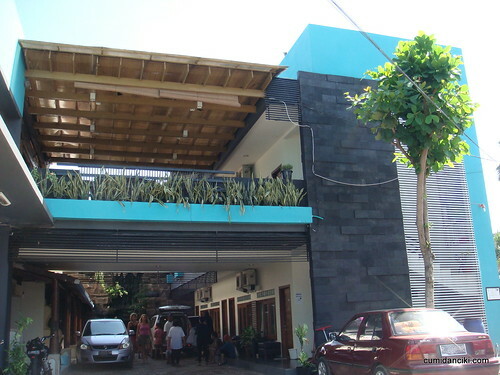 We found the hotels here lovely – clean, modern and affordable at approximately Rp250,000 per night. There are also many losmens/guesthouses to pick from, which have varying degrees of comfort vs price but it was late, drizzling and we thought of treating ourselves to a nicer place after the long ride. 2-3star accommodations here are far better than similar accommodations in Bandung. 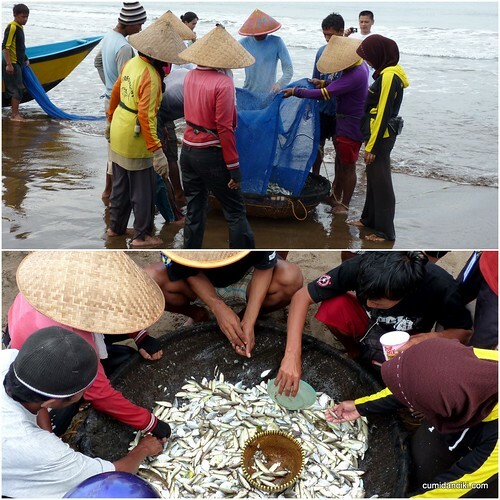 Pangandaran is a small coastal town and a sub district in southern Ciamis regency, West Java, Indonesia. It is a popular tourist destination by locals and the dutch travelers. It is considered to have one of the nicest beaches in Java, with great surfing opportunities due to strong winds and good waves. We found that if one were to compare, the beaches in Thailand are more beautiful to look at, because of the white sand. Beaches not only come in all shapes, sizes, and textures, they come in a virtual rainbow of colors. Most beach fans know that sand color can range from pale cream to golden to caramel, but few realize that in select places around the world, sands can be red, brown, pink, orange, gold, purple, green, and even black! Well, it suffices to say that the volcanic brown black sand at Pangandaran though not as pretty as the bleached white ones, was fine and soft to the touch. Walking along the beach, we did not pick up any unappetizing smells so we concluded that the beach was generally pretty clean. 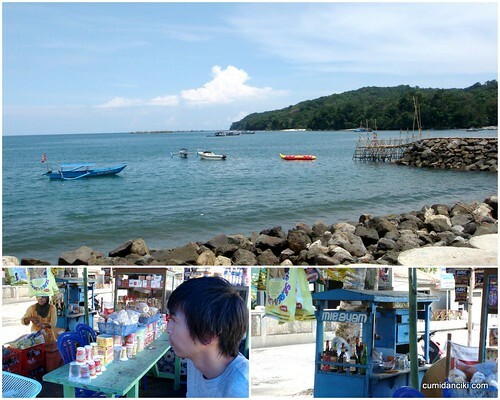 Further down the beach is a 3km peninsula that is the Penanjung Pangandaran Nature Reserve. 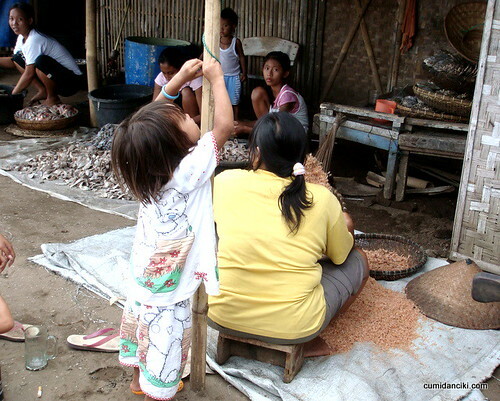 About eighty percent of the nature reserve is secondary rain-forest. For Rp100,000 (for groups of four) – for a 2 hour walk or Rp200,000 for a 5 hour walk, there are jungle treks, waterfall, caves, wildlife (porcupine, bats, wild buffalo, barking deer and monkeys) and flora (mangroves, hardwoord trees and if lucky, there is the rafflesia) to spot. You can hire a guide or walk on your own. On the beach, friendly touts will approach to sell you boat tours around the nature reserve and treks to waterfalls and may be some snorkeling. 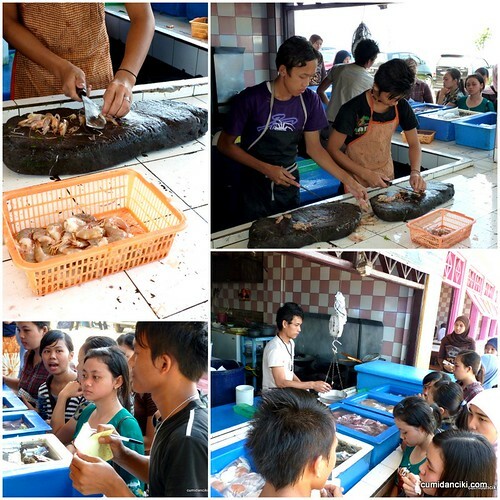 Other attractions here include Batu Karas which is a little Village 1 hour away from Pangandaran. It’s famous for Surfing. This small fishing village 32km from Pangandaran is one of the most relaxed places to kick back in Java and has one of the coast’s best surf beaches, sheltered by a rocky promontory. Most surfers stay in accommodations found 1km beyond the fishing village at the headland beach. 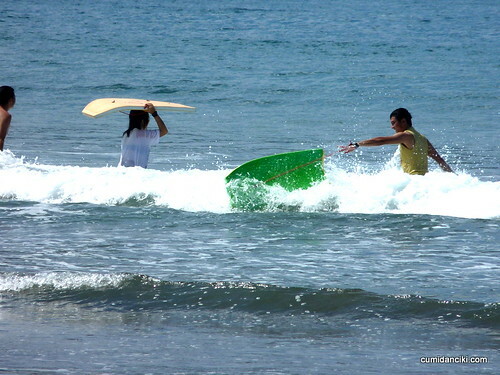 Surfboards can be rented for Rp35,000 – Rp50,000 per day and lessons are available at Rp80,000 per day. Then there is Batu Hiu, a place between Pangandaran and Batu Karas. It is 23km away from Pangandaran and has a recreational park atop the cliffs with views along the coast. Batu Hiu translates to Shark Rock and obviously it’s a shark shaped rock. Green Canyon is possibly the biggest attraction in these parts. A river cruise can be arranged on the emerald river to view limestone outcrops laden with trees, vines and waterfalls to visit. Boats cost Rp 75,000 for a maximum of five people and operate daily from 7.30am to 4pm. Once you get to the most beautiful part of the canyon you can stop to swim, or go for cave visits and there are many fine moments for taking ‘postcard pictures’. 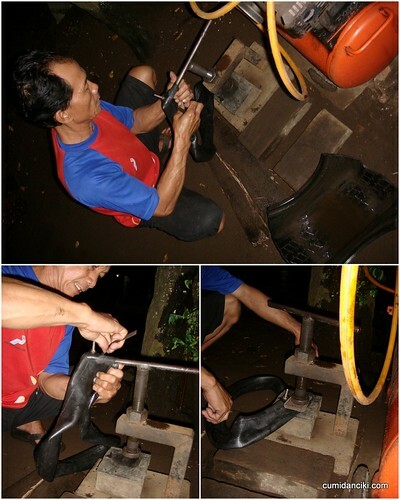 However, boatmen work on a schedule of just 45 minutes, so that only gives you about 15 minutes to swim and explore! If you want to stay longer they will ask you to pay extra. I read somewhere you could jump into the river from a waterfall. We didn’t get to do any of the above. Why? because it started raining after lunch and continued till evening every evening! So much for renting a scooter! We only managed to get 10km out of Pengandaran before we had to seek shelter at a internet cafe/car repair depot. Since we needed to cover a lot of ground getting to Yogyakarta the next day, this ended our adventurous opportunity to explore the outskirts of Pengandaran. On a grimmer note, a tsunami hit the area on the 17 July 2006. An undersea earthquake measured at 7.7 on the Richter scale triggered a three metre high tidal wave. Extensive damage was caused and hundreds were killed including a small number of foreign tourists. After the Tsunami’s reconstruction however, Pangandaran Beach now has many upgraded and modernized hotels and looks better than ever. 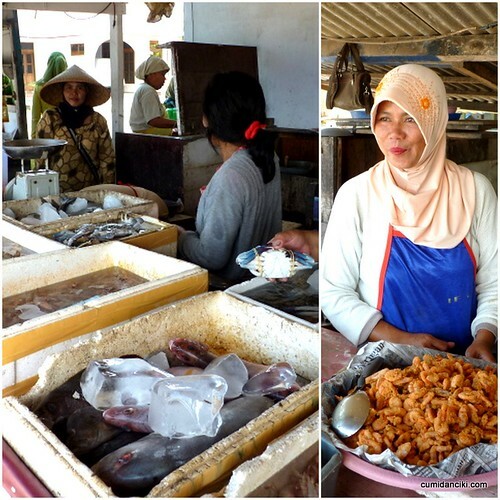 Pangandaran is of course a fishing village and is famous for its seafood. Early in the morning we saw a lot of the fishermen in action, and we also got to sample their catch of the day, by having dinner at one of the BBQ seafood restaurants and it was pretty good. 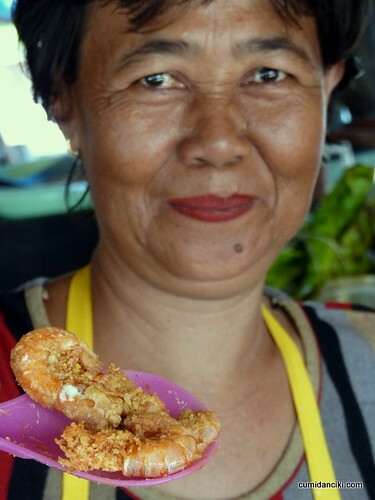 There are also many cheap local stalls for Indonesian food along the beach. 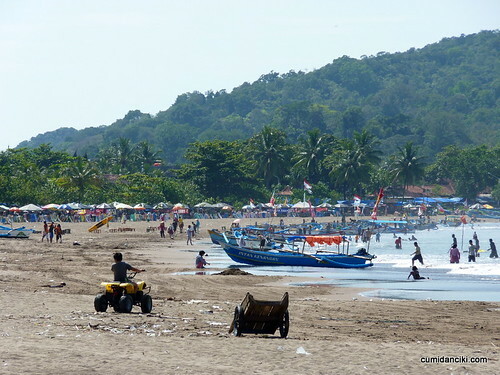 Pangandaran beach already bustling with activity early in the morning. 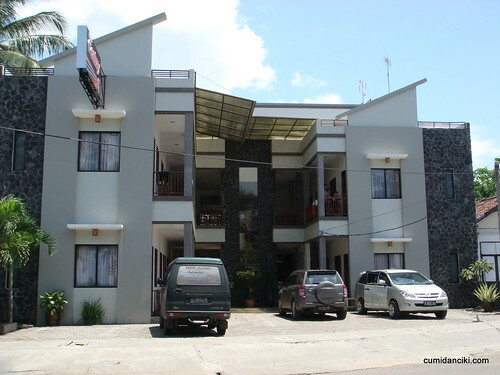 Arriving late on the first night, we stayed here, at Pantai Sari Hotel – clean, modern and close to the beach. On the second night, we stayed at this hotel called Hotel Century which faced the beach. Also modern and new, it only cost us Rp250K per night. 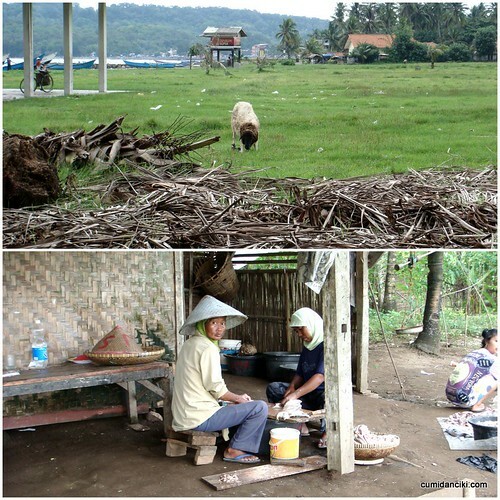 The simplest means of transportation in Pangandaran is by becak (bottom left of collage). 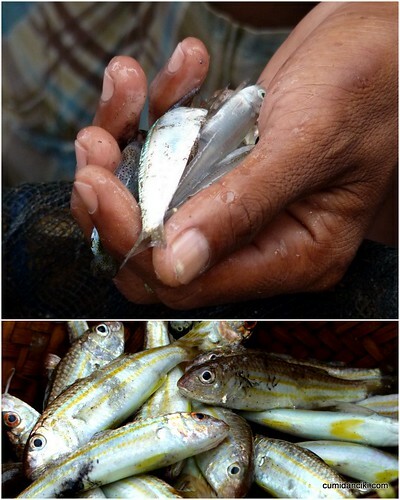 In other places outside Indonesia it’s also known as rikscha. 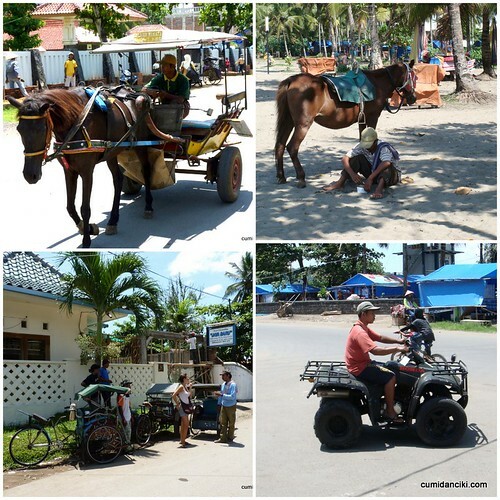 As with most beach towns, you can rent motorbikes, ATVs (bottom right) or tandem bicycles. There is also the slow and steady horse drawn cart as well as horse rides on the beach, which are more of a tourist gimmick than anything else. There are the common angkots and also buses which drive frequently along the coastal roads and into town. care for some fried shrimp? 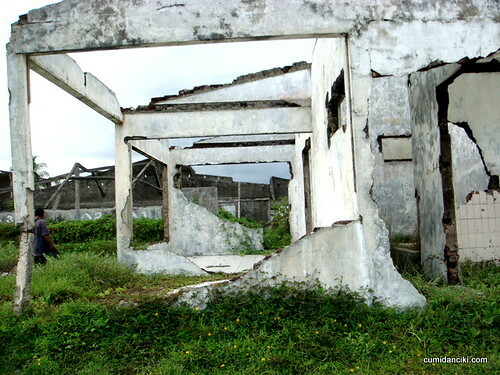 The Tsunami hit area still has skeletal remains of buildings that remind you of the disaster. We spot a Mie Ayam (chicken noodle soup) stall and break for lunch. 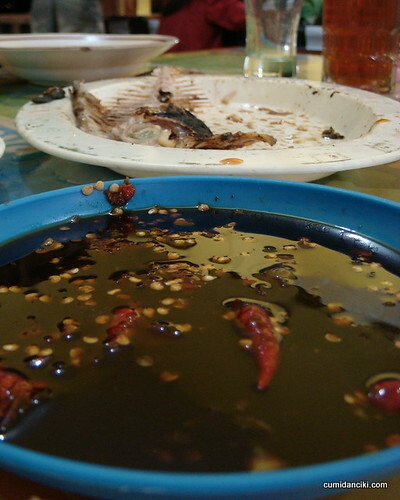 Noodle soup refers to a variety of soups with noodles and other ingredients served in a light broth. Noodle soup is an East and Southeast Asian staple. 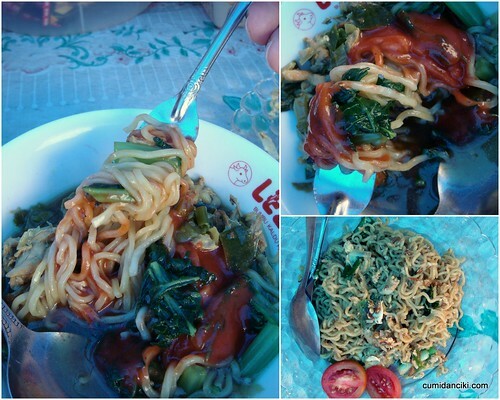 Indonesian Mie Ayam (chicken noodle soup) comprising a bowl of chicken stock, boiled choy sim, celery leaves, diced chicken cooked with sweet soy sauce or in this case, tomato ketchup on top. (left picture of collage). We also had the mee goreng (fried noodles) which is not unlike the Mee Mamak you find in KL. Both were mild tasting and just so-so in flavour. The ice cream man pulls up and we order some ice-cream. 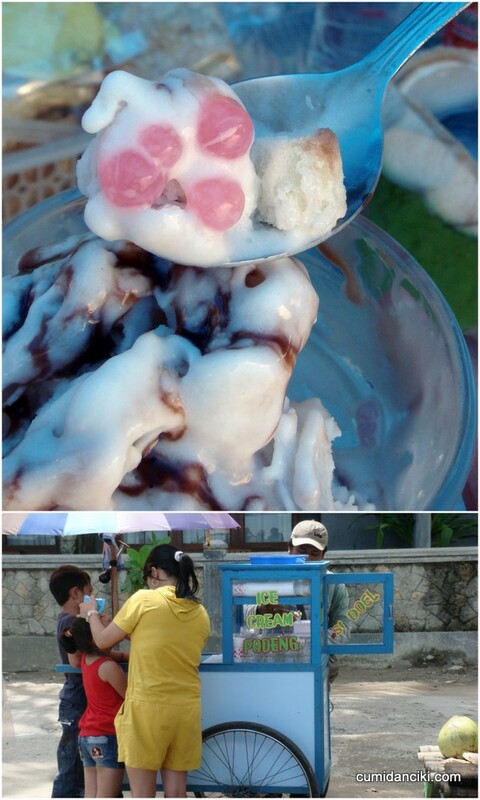 He adds chewy sago beads into the ice-cream as well as coconut flesh and tops it off with chocolate fudge for good measure. This is heavenly on a hot day! 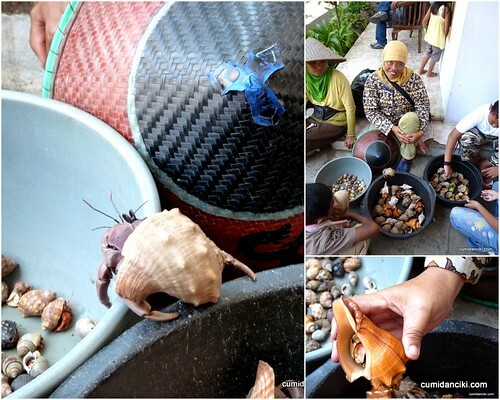 Ladies are seen everywhere in the kampung selling these shells (with sea-crabs still intact) as ‘pets’ for children. It seems cruel if you ask me. 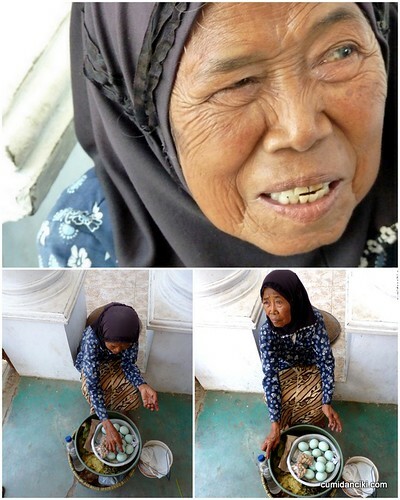 An old, weathered lady selling duck eggs. The lines on her face say plenty. We go back for dinner that night. 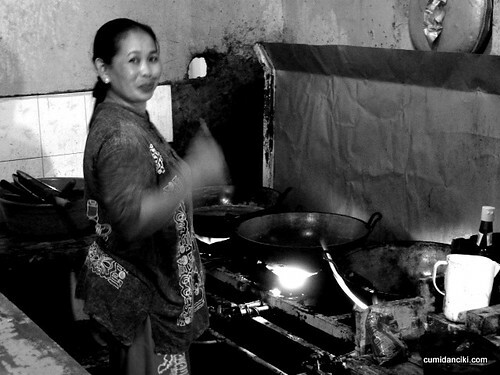 This is the lady who cooked our BBQ seafood dinner. 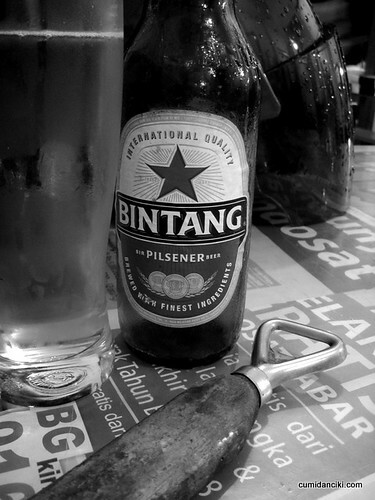 The customary Bintang Beer that is a must for Ciki! BBQ fish and chili sotong. 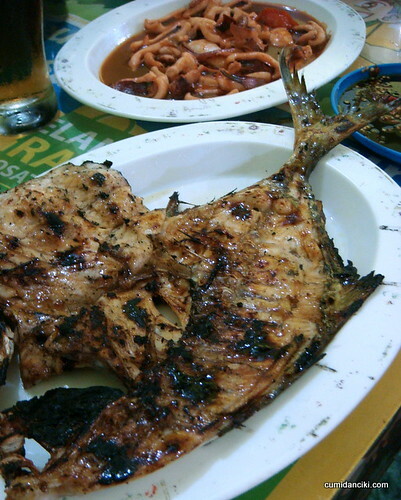 The Fish was freshly BBQ-ed and the sotong was slightly spicy, fried in a tangy, tomato based sauce. The side portion of chili was really hot! We found the texture of the fish light and flaky and pretty darn delicious. 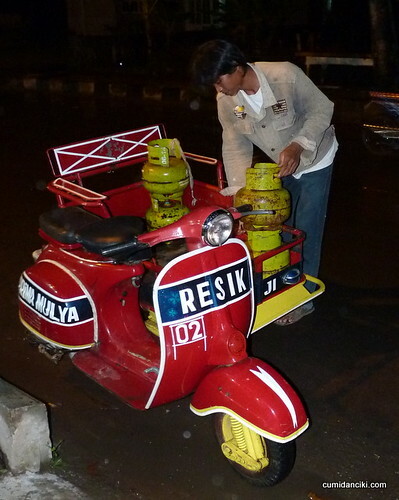 A cute Vespa that we saw, that doubles up as a gas delivery vehicle. 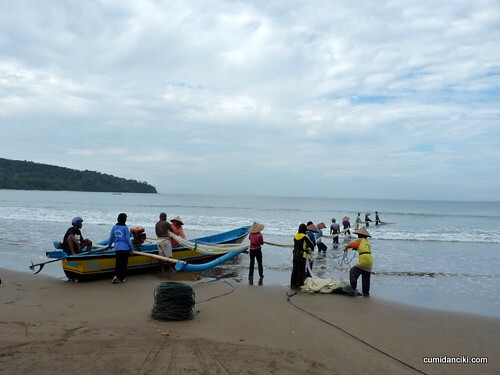 Early the next morning, whilst walking along the beach, Cumi sees fishermen in action. Fishermen reeling in the catch for the morning. It is a huge community project. 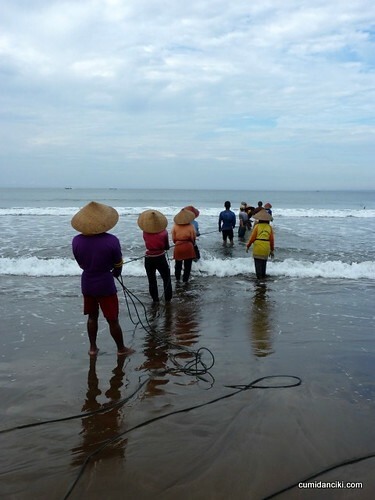 Early morning, boats go far out into the ocean to cast the net then upon returning to shore, 2 teams begin pulling in the net on opposing sides. It was a very long process. Each fisherman/woman retreated backwards pulling the line. The last person would then walk back front to start the process again. Cumi stood there a long time waiting. 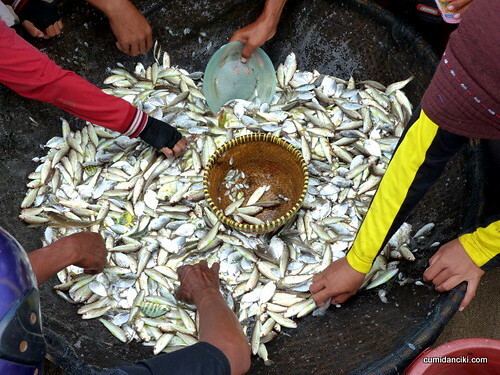 Then begins the task of sorting the catch. 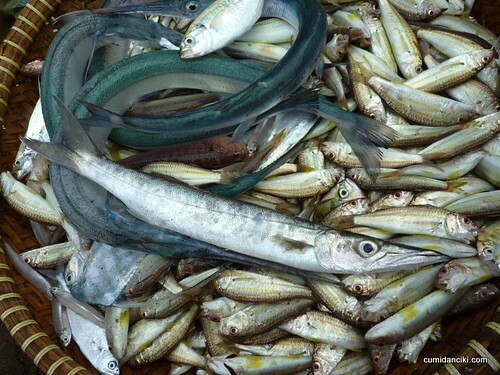 Oh, for the love of fish! Some unusual fish we saw. Can you help us identify them? What fish are they? 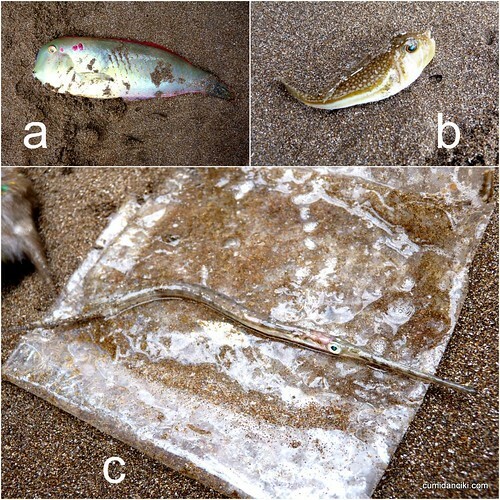 What fish am I ? Next stop, the beautiful Borobudur.. Jogging around in Jogja! I don’t think you can eat the small ones. The last time I was there.. uhmmm… 25 years ago? LOL But yes, I still remember the fishermen catching fish with net on the beach in the morning. 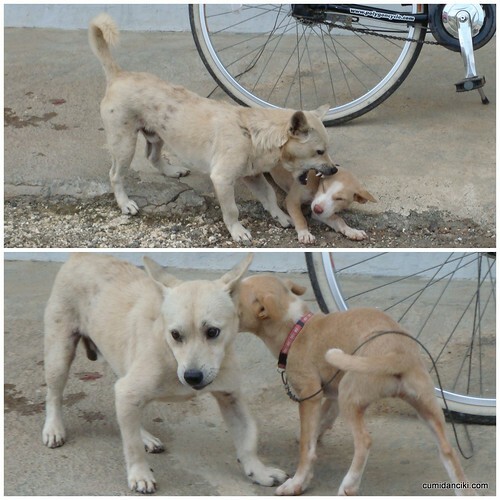 Oh.. those stray dogs are so cute!!! so tempted to buy the 4848 4D after seeing you mention so many times in your blog!!! It might be my jackpot… hmm… can’t wait to see your borobudur pics! just buy la.. u mean up till NOW also have not bought yet ar?! Fish ID time! 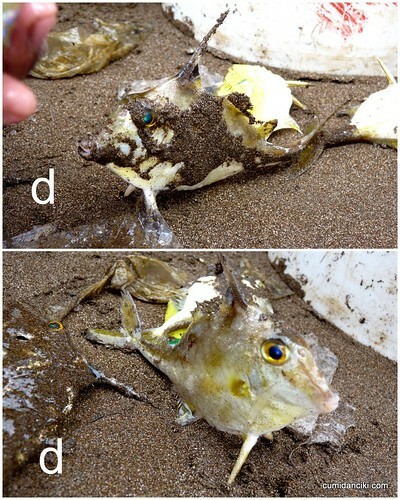 At first glance looks like a box fish, but the the file like fin up top leads me to believe that it’s a File Fish lar. the last pic of the fish… blow fish? but blow fish is rounder right? Are those duck eggs or balut (the duck foetus thing they eat in Phillipines, Thailand and sometimes Indonesia)? 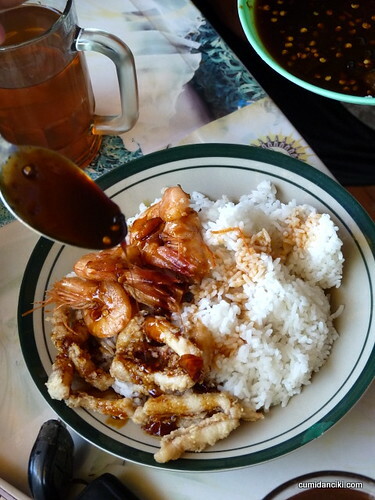 The prawn and squid in ABC sauce looks divine! 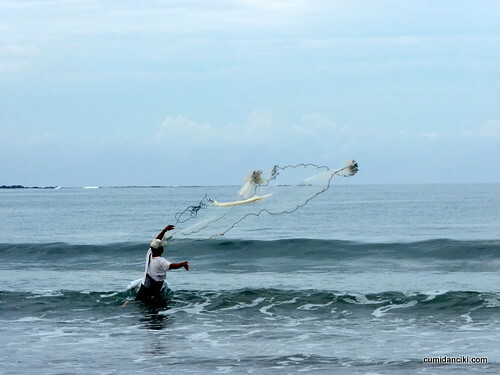 A fisherman casts his net – that is one helluva cool shot. Hi – great blog and lots of great info. so what happened from days 3 onwards?? 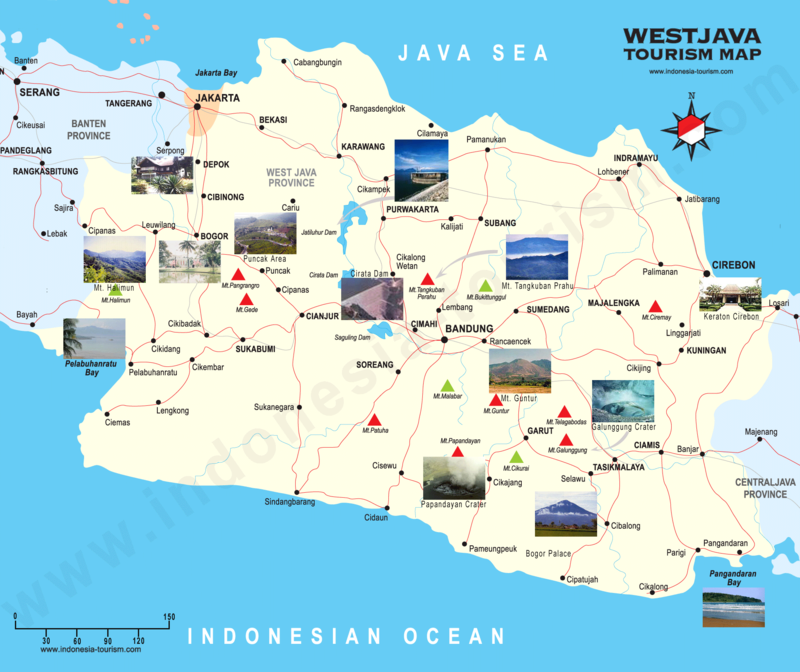 ?I plan to go to from Jakarta to Bandung to Pangandaran to Yogya in Oct and your wesbite has helped me to plan the journey and the place to stay in Pangandaran.